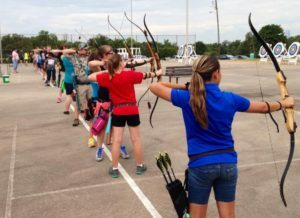 Joe and Stacey Goodwin work weekly with the coaching staff of Trosper Archery Club JOAD (Junior Olympic Archery Development) in Oklahoma City, OK. During the summer months, the team practices at Trosper Archery Club, and in the winter season, at H&H Shooting Sports. Led by head coaches Sid Read and Chuck Morgan, Trosper JOAD offers instruction, training, and competition preparation for all levels of ability, all types of equipment, and in multiple disciplines including target, field, and 3-D disciplines. If you are a youth aged 7-20 and are interested in learning more about the sport of archery, we would love to introduce you to the team! For more information, visit our club site!